There is no such thing as a 100% close rate. Now that we have that out of the way, let’s dig a little deeper. Whether your close rate is 10-20 or 30%, most of your prospects are not purchasing your product. . .today. We’ve worked with companies over the years and have found that even the most standard sales metrics are missing that critical component: time-frame. It’s not unusual for us to hear numbers like 100-10-3-1 to describe a marketing and sales cycle. 100 suspects approached, leads to 10 prospective clients, which leads to 3 proposals, which leads to 1 sale. What we’ve found is that, over time, the actual numbers look more like 100-20-6-4. For every 100 suspects marketed to, over time 20 will become prospective clients, 6 will need proposals, and over time 4 will become clients. What happens between those two numbers? Your constant outreach is what happens. It takes time for the right person to get your message at the right time. With database marketing, we’re not worrying about the initial close rate, or even the initial proposal rate. What we’re focused on is learning from the sales and marketing effort to the 100 initial suspects. Your best future source of business is going to come from people familiar with your company and offerings. Do you ever hear a prospect say, “I was just thinking about this,” when you call? If you’re outreach is consistent over time and if your database marketing game is strong, you will. LeadGen Compass can help with this. From profiling your current customers to find look-a-likes in our databases, to appending marketing information to your pipeline, to building business intelligence interfaces for your marketing team, we’re focused on database marketing. The way our databases are compiled includes a lot of statistics and analysis. It’s the nature of the database because they are so large. 10 million US businesses, 200 million consumers, 2 million farmers and ranchers etc. 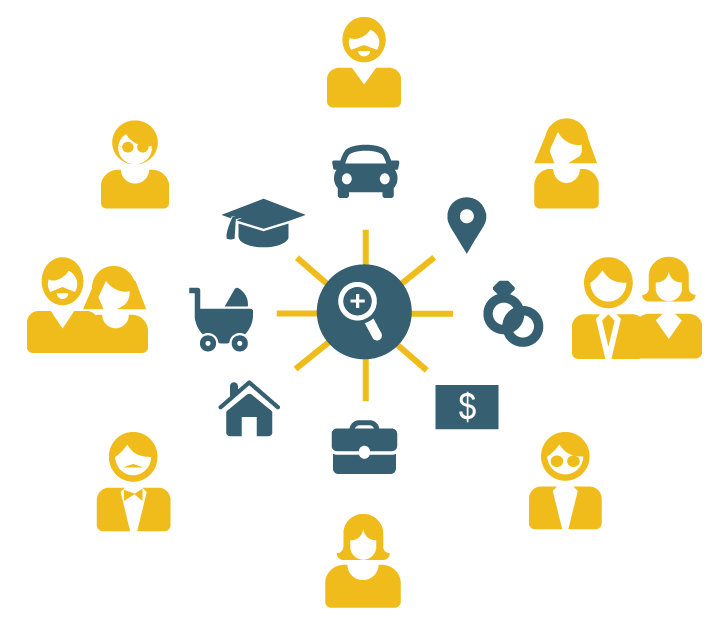 Knowing that, you can use customer profiling to figure out what your best customers, your second best customers, and your not-so-great customers look like in our databases. We call that customer profiling and it helps you spend less time calling everyone because you can concentrate on your best prospects first. Appending marketing information to enhance your database is a tried and true way to find new commercial sales leads and generate new business. LeadGen Compass can help your team because we originated in the list business, and database marketing is our first love. The next-big-thing for the last decade has been Big Data. We talk to companies each day that have bought into the vision and are now asking, what’s next? “We have all this data, probably too much data, so what do we do with it?” LeadGen Compass has been building business intelligence interfaces for the last five years and we can do the same for you. The easiest way to think of a business intelligence interface is to use a car driving analogy. When you drive a car, you rely on more than just the information coming through your windshield. You use a dashboard to monitor your speed, the engine temperature, your fuel levels etc. You also use your rear-view and side-view mirrors, and if you’re driving with passengers, you’re taking in information from the things they say and do too. A business intelligence dashboard does the same thing for your business. It takes in all of your current business information, all of your historical information, and information from outside sources and puts it into a format you can use to steer your business. We’re incorporating it into our public views of our marketing databases right now. We have demonstration dashboards available upon request. It’s a tool our customers benefit from, especially senior executives who have questions about how the company is performing, and it’s a service we can provide to you. Put the power of information at your fingertips with a business intelligence dashboard from LeadGen Compass. LeadGen Compass can take your database marketing game to the next level. If your close rate is less than 100%, we can help you get more from your company’s sales and marketing data. Contact LeadGen Compass today to learn more about what we can do for your company.